← WTF is Going on with Today’s San Diego Groupon? My boy Macaroni just sent me this picture. No clue where it is or when it’s from… in fact, I didn’t real think anything of it at first glance…just a pie eating contest, right? Not so much. 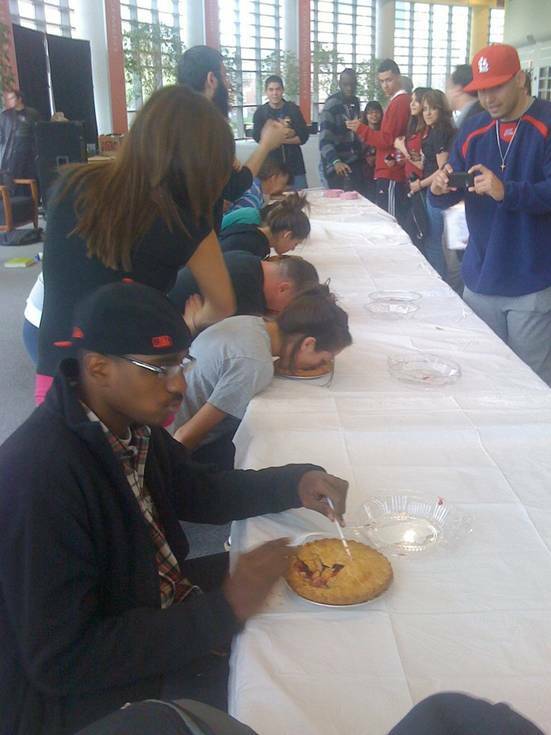 It’s a pie eating contest for 5 or 6 people, and dessert for 1 dude. This frickin’ dude…”Oh, you need one more person for a pie eating contest? It’s right after lunch? Yeah, I’m down.” Hoodwink City. Love this guy. Hands behind their backs, people are smashing their faces into pies. This clown, on the other hand, couldn’t care less about a contest. Just gimme a damn plastic knife and fork. This entry was posted in Entertainment, Events, News, Sports and tagged Contest, Just here to eat brah, Pie Eating, Pie Eating Contest. Bookmark the permalink.